Now if you look really, really closely at this photo I took a few hours ago you can see the Holy Chickens taking their daily stroll in the churchyard at the bottom right hand corner. Today the rooster deigned to join his lady friends in pecking the grass and squawking. Equipped with my walking stick I took a break from my emails to walk over to Magny using the “chemins blancs“, or the “white paths” (called this because they do look white from a distance due to the calcium rich rocks around here – good for the vines!) that run through the fields and vineyards between the two villages. The weather was gorgeous and sunny and springlike. Franck was busy weeding at La Maison des Deux Clochers and was happy to report that he got help pruning the old rosebushes that we inherited when we bought the house eight years ago. He had started the pruning, very unsure of himself, when Madame Baux, our friendly neighbour, came over and informed him that he was completely botching the job. Another neighbour was summoned to discuss our rose dilema, and then all three of them went down the street to find the Italian lady who apparently knows everything there is to know about roses. She was more than happy to help, and as it happened her husband lived in La Maison des Deux Clochers for a few years before they got married (this was about 40+ years ago), so the quartet trooped back up to Les Deux Clochers, the Italian expert pruned all of our rosebushes, plus the neighbour’s while she was on a roll , and then Franck gave her a tour of the house. After the tour Franck mentioned off-handedly that the grape vine that we planted last year also needed pruning, but it was discussed and agreed that grape vines fell under Madame Baux’s area of expertise. She got down on her knees forthwith and set about doing an expert job while the Italian neighbour imparted more rose wisdom to Franck. So for those of you who enjoy the garden this year, remember that it was a village wide effort! This entry was posted in Uncategorized on March 27, 2007 by admin. My computer problems have seemed to have settled down in the past few days, although due to the events of the last six weeks I still hold my breath when I check my emails every morning. We don’t really have time, however, to start to catch up on our backlog because our first guests of the season (although the “season” gets longer every year and is almost year-round now) arrive at all three properties this week. This means small repairs, spring cleaning, and basically just a lot of running around like, yes, chickens with their heads cut off. And speaking of chickens, yesterday Franck was perched on a ladder cleaning the windows of the green bedroom of La Maison des Deux Clochers in Magny. As our previous guests have no doubt discovered, across the street beside the church live a flock of chickens and one very throaty rooster. Franck was distracted from his window washing by the sight of a dozen or so chickens strolling languidly around the church, pecking at the grass and the newly sprouted daisies, and squawking with delight. The rooster, having none of this pecking business, stalked round to the front of the church and nestled down just in front of the ancient wooden door for a little nap. Franck was certain there had been a Great Escape. He threw down his cloth and ran across the street to the neighbour to alert her that her chickens were on the loose. If any of you have sent me an email over the past few days and I haven’t responded, I’m sorry. I am not ignoring you! Our computer curse continues, now with Norton Anti-Virus blocking my email and all other useful programs on my (brand new!) computer that was finally released from customs after much coaxing and many heated phone calls. Due to all of this I am currently feeling very anti-technology and nostalgic about the good old days of pen & paper, which I am certain did not cause nearly as many headaches as Microsoft programs, Intel processors, and anti-virus software. However, during a brief window between computer breakdowns, we did, somewhat miraculously I might add, manage to get out a new version of “The Grape News“. Otherwise we’re readying the three properties for the first of our Spring clients. We’re adding a bit of decoration here and there, doing any necessary repairs, and just basically primping and organising so that our guests have the best possible time during their stays and are able to make the most of this wonderful area of France. This morning I fled the computer breakdown and the resulting thunderous expression on Franck’s face and hightailed it over to La Vieille Vigne to add some new books to the library and a new desk lamp. I love being in there alone, as I do with all three properties. I took a moment to just look around me and to enjoy the end result of all the hard work and thought that went into renovating and furnishing our little winemaker’s cottage. It was one of those rare instances when I actually took the time to stop, revel in what we had accomplished, and yes, pat myself (and Franck, but he was at home cursing my computer) on the back just a little bit. In any case, it thankfully had me thinking of something else other than my lack of email for a few minutes! I’m also attaching a Springtime photo of Magny with the Mont Saint Victor in the background to this blog, as this particular photo is one of my favorites and always cheers me up. And during the Ides of March, who can’t use a little cheering up? This entry was posted in Uncategorized on March 22, 2007 by admin. We just got back from another great week in Italy. This time we stayed further North, in the refreshingly untouristy region of Piedmont. The place we stayed in was actually an apartment within a villa nestled in the vineyards. The couple from Los Angeles who own it have done an absolutely stunning job on the renovations and restoration (and as someone who has done this more than a few times, I have infinite respect for the work and thought that goes in to such a project). The apartment was wonderfully comfortable and functional, and made perfect by such details as its vaulted brick ceiling. The region was fascinating, and the town we loved most of all was the little town of Costligliole d’Asti which was only one kilometre away. We didn’t see another tourist in our whole week there, and the people in the shops were obviously not the jaded sort that you can come across in Florence, Rome, and other more popular areas. Each time we went to buy our daily prosciutto and mortadello from the local “charcuterie” the girls were each given a Chupa Chups lollipop and a balloon! Imagine the joy! They were very proud that they knew how to say “Buonjourno“, “Grazie“, and “Ciao” to the lovely lady who served us our daily cappuccinos and hot chocolates in the town’s coffee shop. We also learned the Italian names for all the different flavours of gelato, as we had at least two each a day. We did a day trip to the “Cinqueterre” area of the Italian Rivieria. The panoramas were indeed stunning, but I felt as though, besides the lovely little Italian towns perched on the cliff faces and of course the ubiquitous gelato shops, I had been jettisoned back to North America. Everyone who we met or passed us on the streets was North American, and spoke with the same accent as me. 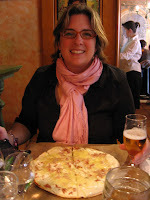 It was a bit unnerving, and made us rejoice in the authentic “Italian-ness” of our spot in Piedmont all the more. It reinforced what we strive for back at home in Burgundy – to create places where our guests can truly live like locals. 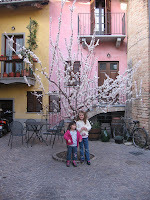 This entry was posted in The Germain's European Adventures on March 16, 2007 by admin. 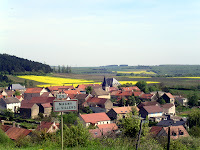 Several months ago Franck and I had arranged with his sister and brother-in-law for Charlotte and Camille to spend a weekend at their place in Magny-les-Villers with their cousins. The designated weekend was fast approaching, however, and Franck and I still hadn’t chosen a place to go for our getaway. The problem with living in Burgundy is that we’re spoiled for choice. Did we want to grab a cheap flight to Morocco? Head up to the Swiss mountains? Go to Belgium perhaps for some moules frites? Even though we’ve been living in France for going on three years now, the myriad of possibilities of things to see and do in such close proximity to our house never fails to thrill and, at times like this, paralyse me! But when it came right down to it we only had two nights and not a huge budget, so on a whim we booked a hotel room in the gorgeous town of Colmar, in Alsace, where we had stayed in December 2004 with the girls taking in Colmar’s very famous and not-to-be-missed Christmas market. Within a few minutes of making the phone call I began fantasizing about enjoying a “tarte flambee” with a pint of cold Fischer beer. Colmar (and the region of Alsace) is only a two and half hour drive away from our house here in the Cote D’Or, yet when we arrived we really felt as though we had landed in a different country. The proximity to the German border creates a fascinating French / German fusion evident in the culture, the architecture, and, of course, the fabulous food. You even hear many people in the street speaking incomprehensible (to me, anyway) Alsatian which is a mix of French and German. Somewhere between a frothy hot chocolate and a huge slice of apple pie in our favorite tea and coffee shop, it occurred to me that Alsace is a wonderful short trip for our guests to take from any of our three vacation rentals, so here is all the info. that I have gathered to help you do exactly that. As always, don’t hesitate to contact me with any questions. I don’t want to post my email here so as not to be spammed to death, but you can find it if you go to our website http://www.myburgundy.com/ . 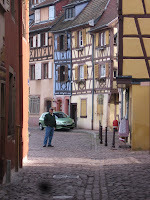 We find Colmar to be a great base in Alsace. It is an amazingly picturesque town, near all the famous wine villages such as Riquewhir, Hunahwir, Saint-Hippolyte, etc. and is very easy and pleasant to walk around. Similar to Beaune, there are tons of restaurants and shops for you to enjoy within easy walking distance. For breakfast, a casual lunch, or a snack you can’t do any better than Jadis & Gourmand which boasts amazing tarts and pies. The atmosphere is cozy and very Alsatian – great hot chocolates, teas and coffees. We ate at this restaurants, known as a “Weinstrub” or Alsatian bistro, several times. 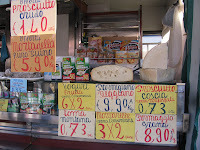 It is popular amongst the locals, very good, and reasonably priced. Go here for tarte flambees, munster melts, and all the other traditional Alsatian dishes. Reservations recommended as it is very busy (always a good sign!). This was Franck’s choice, and I’m sure the fact that the waitresses are all kitted out in traditional Alsatian dresses had, ahem, nothing at all to do with that…in any case, at first glance it was evident that our waitress wasn’t quite the sort of fetching Alsatian lass that Franck had had in mind, but nevertheless we had a delicious choucroute with friendly (and costumed!) service. However, we felt the price to be a bit excessive compared to the Koifus. The choucroutes are HUGE so whatever you do, don’t bother ordering an entree beforehand. Alsace is a very well-known wine making area, so of course we had to stock up our ever diminishing cellar and also buy a few bottles to put in my Dad’s cellar. the wines are completely different than Burgundian wines, and make a good contrast to gauge the mid-blowing depth and diversity of France’s “terroirs“. Last time we stopped in the the wine co-op in the village of Hunawhir, which was very good, but this time it too was closed for winter vacation. 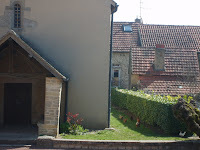 Instead, we tried the Caveau de Ribeauville in the equally charming village of the same name, and were not disappointed! The diversity of the wines was huge, the prices very reasonable with a large range in prices, and we had the luck of having a tasting with one of the winemakers who sells his grapes to the cooperative. He absolutely insisted on pouring us huge glasses as he was; a) thrilled to be talking to a Burgundian and, b) convinced that otherwise we wouldn’t be able to properly smell the aromas. Eventually Franck and I had to request for the “crachoir” to be brought out, which is a rare occurrence for us! Definitely a great place to taste and purchase local wines such as Rieslings, Muscats, and Gewurztraminer. Alsace has a “Route des Vins” or “Wine Road” just like Burgundy, so just follow the signs and definitely devote a day to wandering around the winemaking villages such as Riquewhir, Saint-Hippolyte, Benwhir, etc. etc. We also visited the Musee d’Unterlinden (right beside the tourist information office) in Colmar, which is a very human size (it only takes about 1 and a half hours to tour through) and has a a stunningly rich medieval art collection. If you have the time it is certainly not to be missed. This entry was posted in The Germain's European Adventures on March 13, 2007 by admin.